Do you own more than one Android device, for instance, a smartphone and a tablet? Well, if the answer to this question is yes, Google Play Services has an update that you may really relish having on your devices. It’s called Instant Tethering and what it does is make your life easier when it comes to connecting your Wi-Fi only tablet to a mobile hotspot, for instance, your smartphone. The updated Google Play Services will work in two ways. First, a smartphone will be able to share its cellular data connection with other devices (tablet) that are signed in with the same Google account. In the second instance, the same smartphone can also locate any of your other signed-in devices that have an active data connection, thus getting data connection from this device. Apparently, this update has been reported by those using Google Play Services 10.2, but it seems the search engine giant is also making it available as a server-side update. As long as the feature is enabled, your devices will automatically communicate and thus connect whenever possible. If you are the kind who is always on the road and you have a tablet along with your usual smartphone, this Google Play Services update may just be what you’ve been missing. If the tablet has no SIM card slot, you must use an external device to connect it to the internet through Wi-Fi. 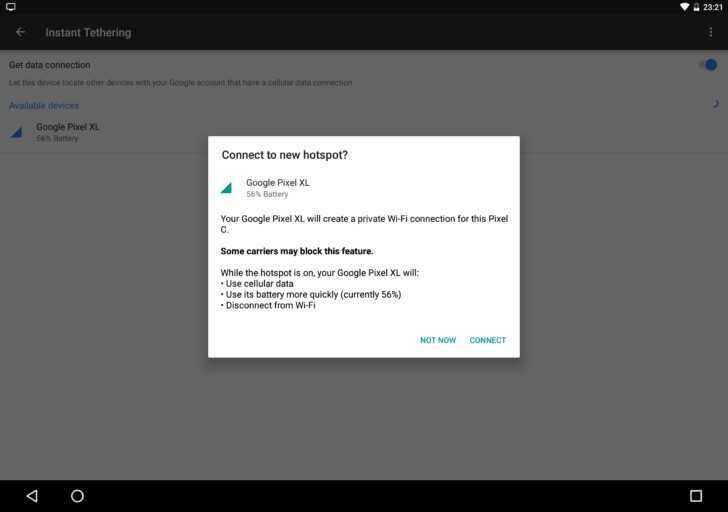 It is possible to turn on your smartphone’s tethering & portable hotspot in order to connect your tablet to the mobile data, but this needs you to go to the Settings>Wireless & networks>More>Tethering & portable hotspot in order to turn on Portable Wi-Fi hotspot. As you can see, this is indeed a long process. Enter Instant Tethering. With Instant Tethering, your tablet will automatically find your smartphone and connect to its cellular data as long as they share the same Google account. In order to keep you alert, this updated Google Play Services feature will let you know the amount of battery juice still left on your smartphone via your now internet-connected tablet. To check if the feature is available on your phone, go to Settings>Google and in there, you should see the Instant Tethering option added to the list. Otherwise, you may have to keep waiting. At the moment, the latest Google Play Services 10.2 is only available to those using the newest version of Android 7.1.1 Nougat. This means that this feature can only be accessed by those on the Google Pixel and Pixel XL, Google Nexus 6P and Nexus 5X as well as the Nexus 6. While these smartphones can both act as the hotspots as well as clients, the likes of Google Nexus 9 and Pixel C tablets can only work as clients since they lack cellular connectivity. As noted earlier, Instant Tethering is rolling out to those using the latest Android 7.1.1 Nougat first.